Job categories allow you to assign jobs into various categories for reporting purposes, job filters, etc. You may want to track after hours call-outs separate to standard jobs, or want to track different services you provide. 1. 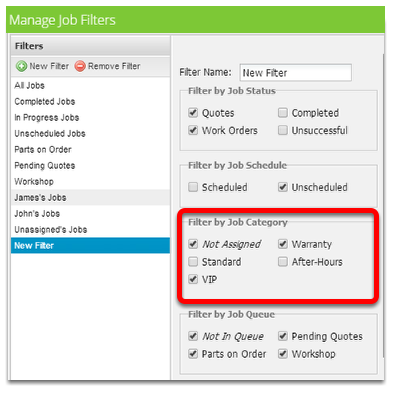 You can create specific job filters based on categories. 2. Categories can be shown as different colours on the staff and calendar schedule. 3. When exporting your jobs to excel it is possible to segment the data by category.